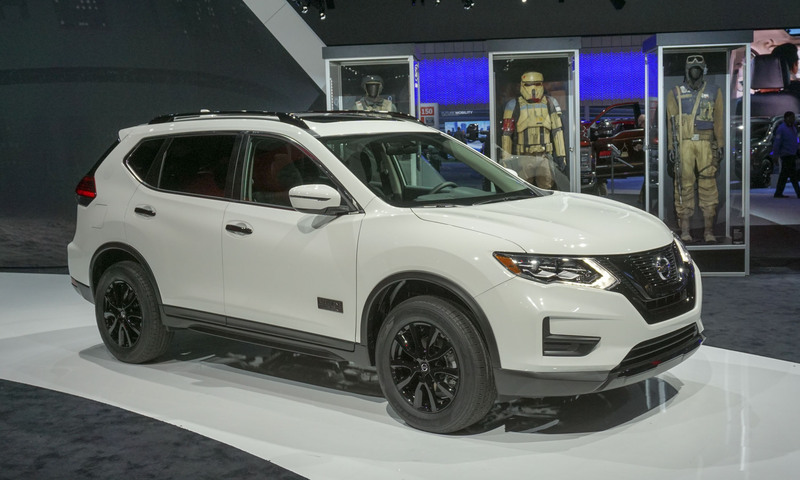 It seems that offering a roomy 7-passenger crossover is a requirement to stay competitive in today’s U.S. automotive market. 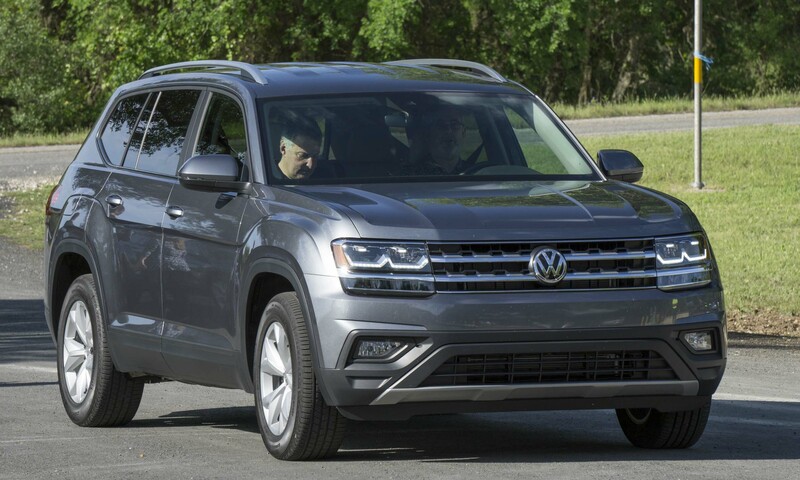 Although the Volkswagen Touareg did a commendable job filling this need, for 2018 VW is going larger and more mainstream with the all-new Atlas. 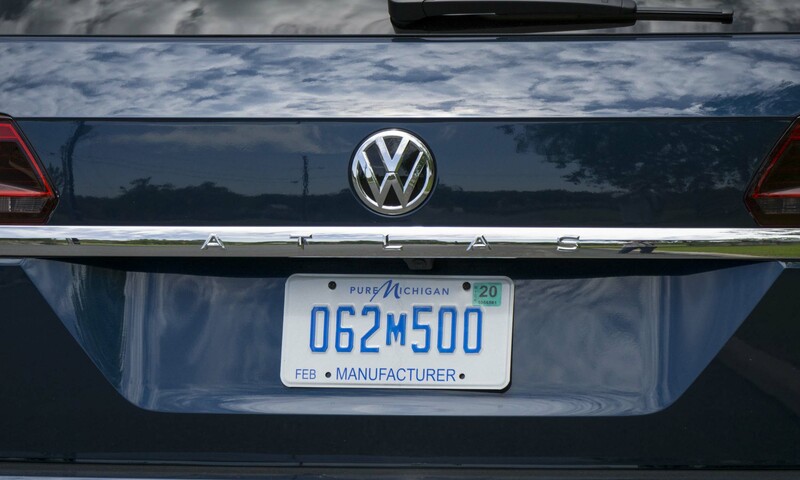 “This is the biggest and boldest Volkswagen we have ever built in the United States, delivering the distinctive design and craftsmanship we’re known for, now with room for seven,” said Hinrich J. Woebcken, CEO of the North American Region for Volkswagen. 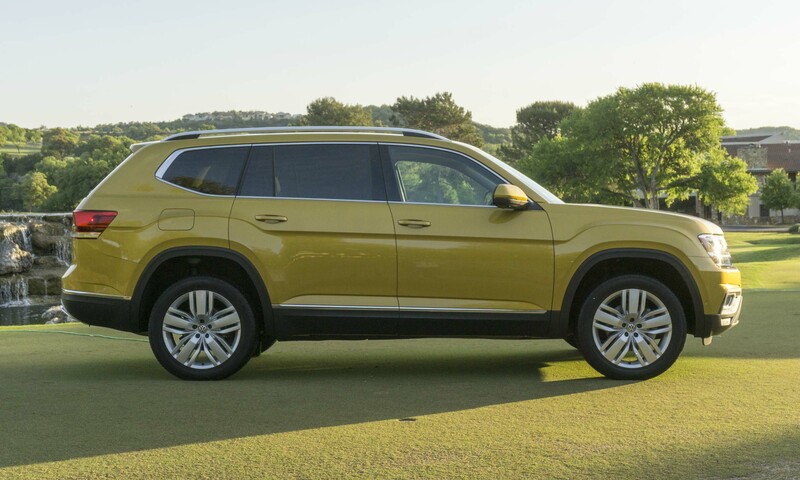 “The Atlas marks a brand-new journey for Volkswagen to enter into the heart of the American market,” he noted. 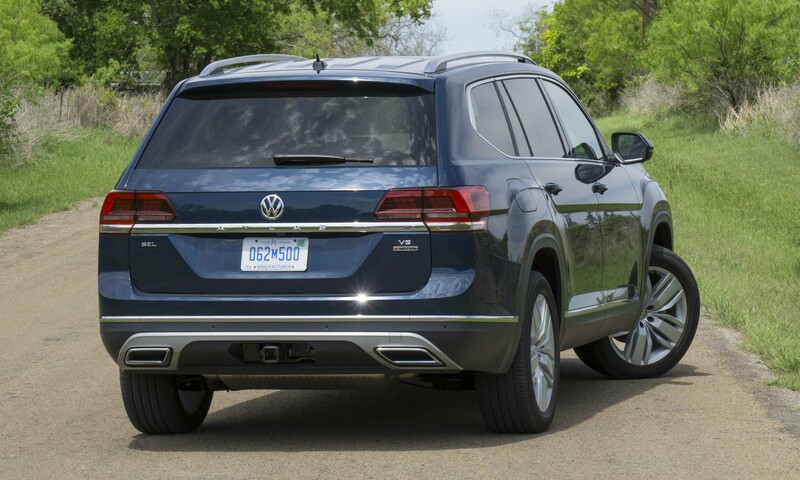 Larger in just about every dimension, the Atlas is actually lighter than the outgoing Touareg. 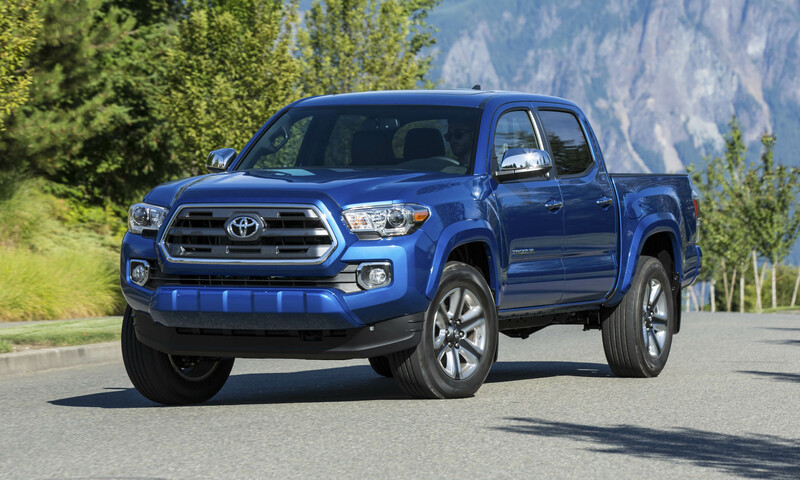 Styling is clearly all new, and while it is a bit generic, the design is clean with attractive headlights, integrated exhaust outlets and bulging fender flares. One big surprise: the obvious lack of Atlas badging on the vehicle. 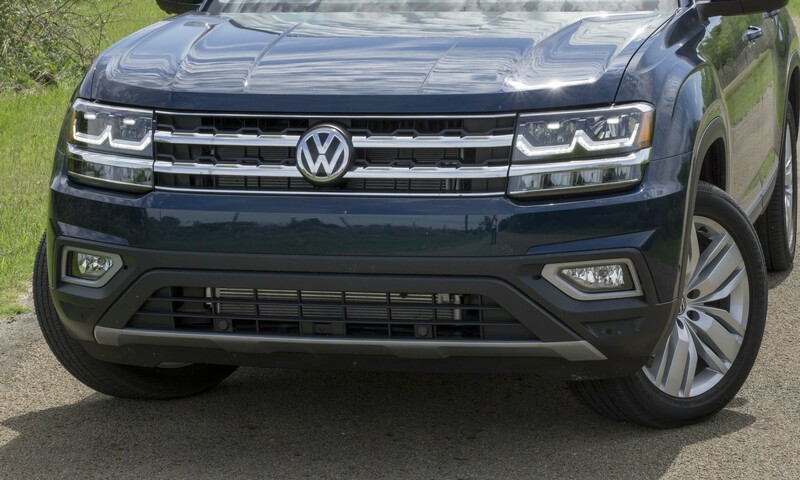 There are large VW logos on the front and rear, but the Atlas name can only be found on a chrome strip at the rear. 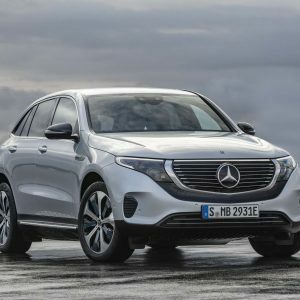 Why is the German automaker launching a brand-new vehicle but hiding the name? 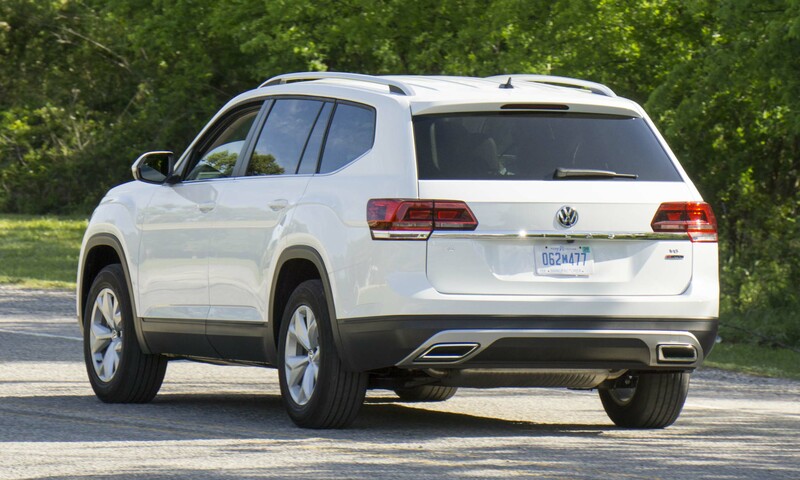 Strange, given that this is the first VW SUV with a name that Americans can easily pronounce and spell. The Atlas will be available in four trims: S, SE, SEL and SEL Premium. The S, SE and SEL will ultimately be available with both 4-cylinder and V6 engine options, as well as a choice of front- or all-wheel drive (all-wheel drive is not available on 4-cylinder Atlas variants). 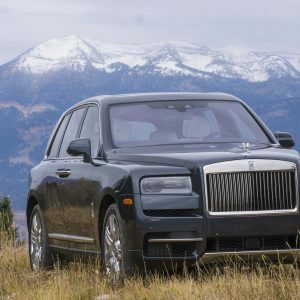 However, the 4-cylinder Atlas will not be available until later in the year. The base-level Atlas has a starting price of $30,500 (4-cylinder, front-wheel drive). 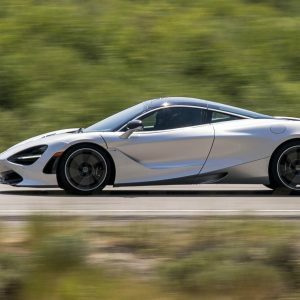 The V6 engine adds $1,400 and AWD is an additional $2,300. 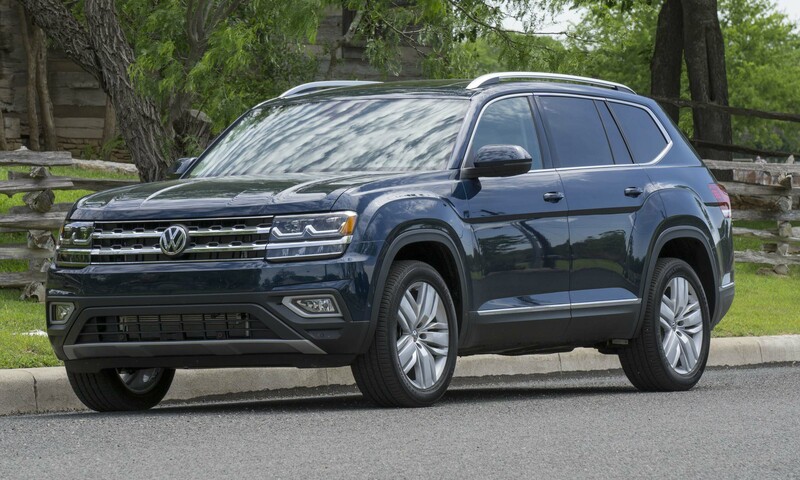 Standard equipment includes dual-zone climate control, a 6.5-inch color touchscreen display, Bluetooth connectivity, a rearview camera, roof rails, LED headlights, and a 6-speaker audio system. 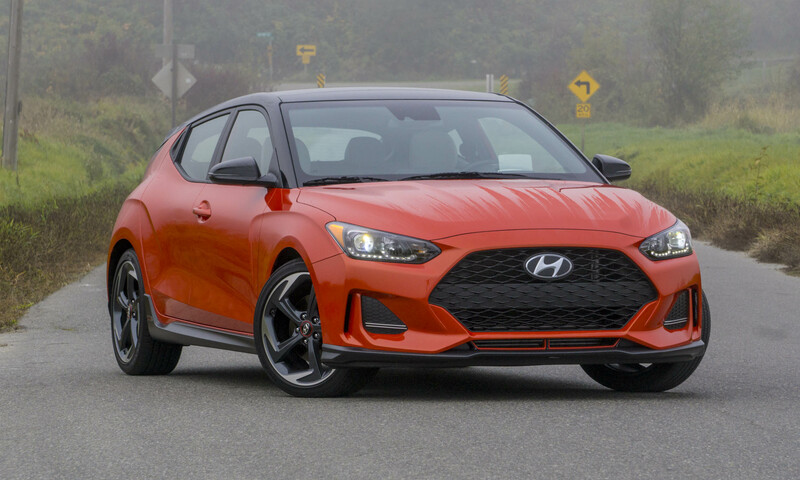 Priced at $33,590 (4-cylinder, front-wheel drive), the SE upgrades the S with keyless access and pushbutton start, rain-sensing wipers, heated door mirrors, automatic headlights, leatherette-trimmed seats, a power driver’s seat, heated front seats, and an upgraded audio system that includes an 8.0-inch screen, HD/Sirus XM radio and eight speakers. The SE also gets a Blind Spot Monitor with Rear Traffic Alert. The Atlas SE V6 is priced at $34,990, while the AWD SE is $36,790. 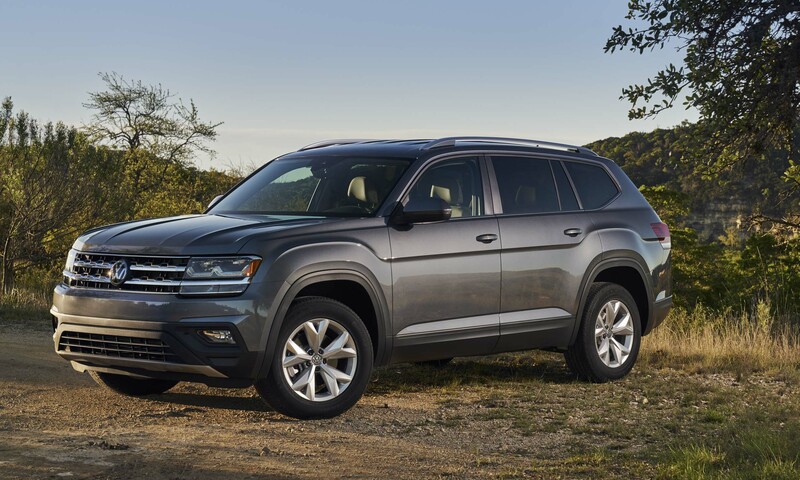 The Atlas SE can be equipped with an optional Tech Package that adds remote start, 3-zone climate control, a power liftgate, adaptive cruise control, Lane Departure Warning and Front Assist. 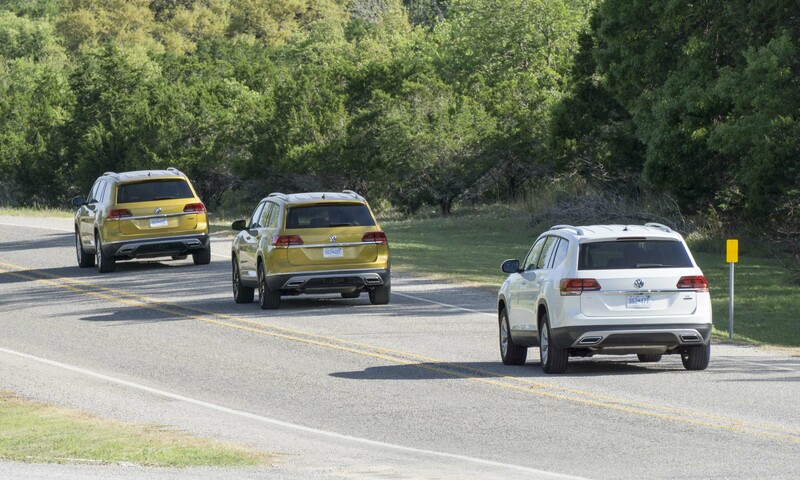 Front Assist includes Forward Collison Warning (which alerts the driver to an impending crash) and Autonomous Emergency Braking, which will automatically apply brakes if no action is taken by the driver and the vehicle is below 18 mph. The Tech Package adds $2,100 to the SE price. The top-level Atlas SEL is priced at $39,160 (4-cylinder, front-wheel drive). The SEL includes everything from the Tech Package and adds a panoramic sunroof, a power passenger seat and park distance control. Prices for the SEL V6 start at $40,890 and SEL V6 AWD at $42,690. The SEL Premium is only available with a V6 and AWD, with a price of $48,490. 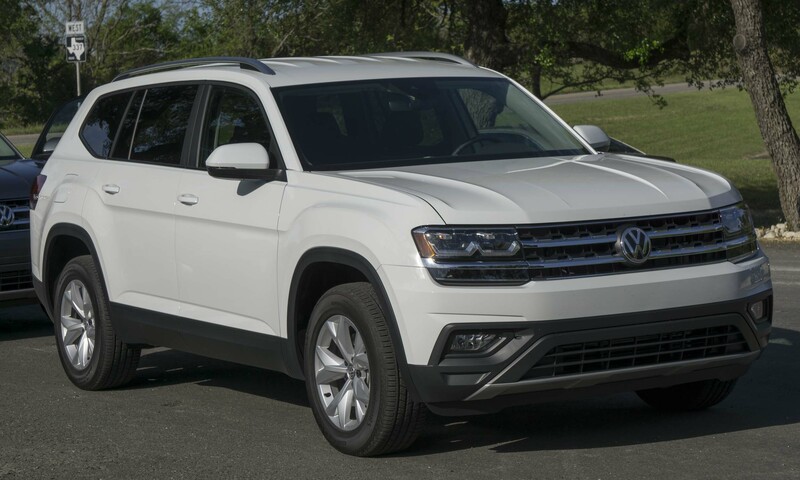 This top-of-the-line Atlas upgrades with LED taillights, power-folding mirrors with puddle lights, a digital instrument cluster, ambient lighting, leather trim, cooled front seats, heated rear seats, GPS navigation and a 12-speaker Fender premium audio system. 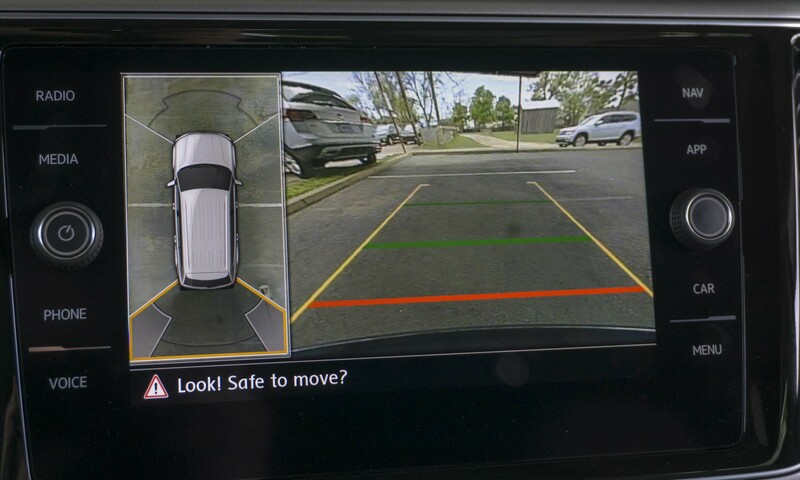 Also included are an area-view camera, Park Assist that can automatically locate a space and steer the car into it, and Light Assist that automatically lowers the high-beams if an oncoming car gets detected. This is a rather large crossover, so the interior is roomy. 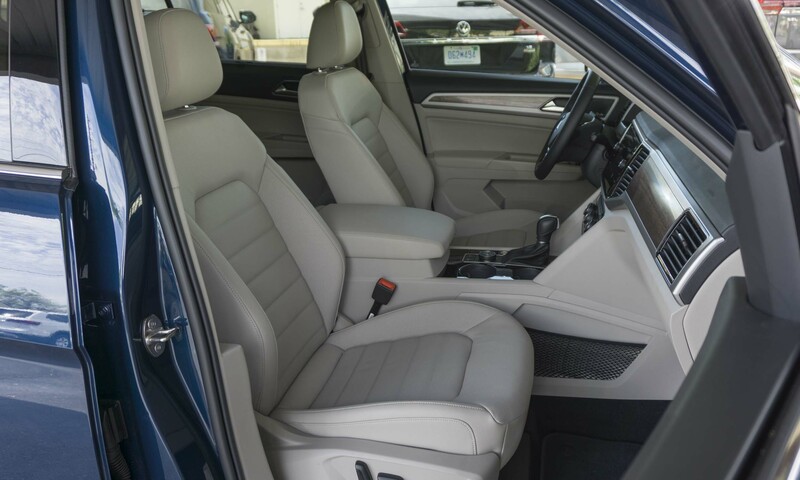 Front seats are big and comfortable, and there is plenty of storage space with multiple cupholders and a large covered center console. 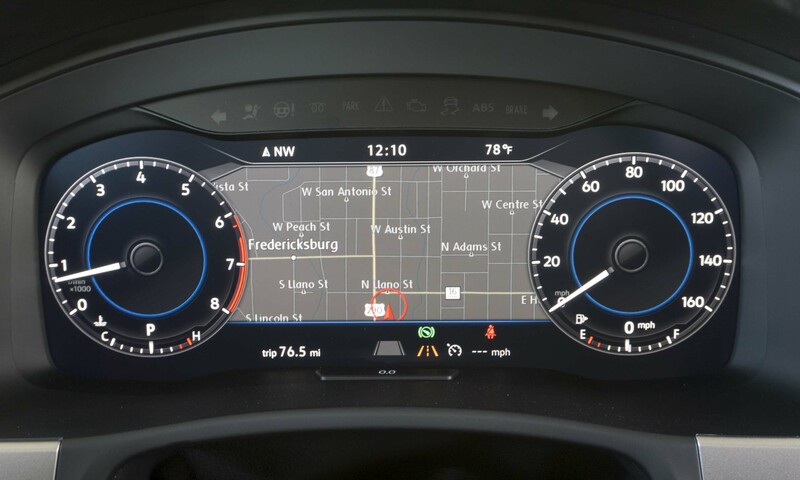 The top-level Atlas gets a digital instrument cluster that allows the driver to customize the dash display. For example, the navigation map can be placed between the gauges for easy viewing by the driver. The second row accommodates three and offers impressive legroom. The center seat is a bit narrow, but still usable — the flat floor helps usability, even for an adult. (Captain’s chairs will be available at a later date.) 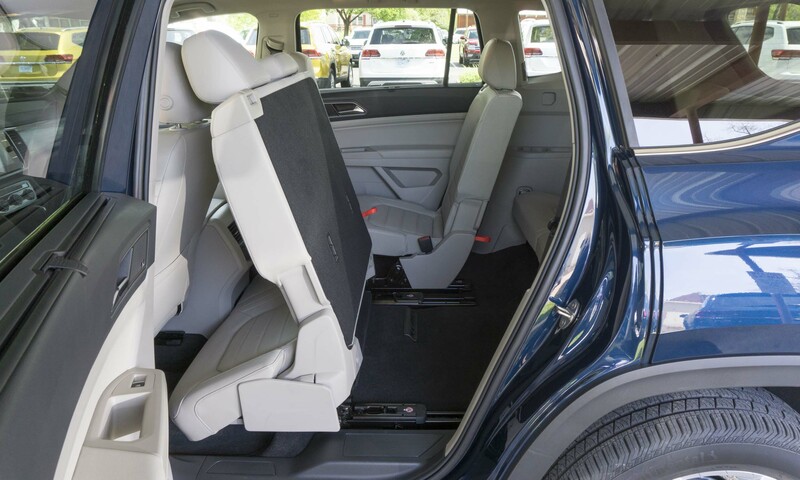 To access the third row, the second-row seats tilt forward without folding, making it possible to leave a second-row child seat installed and still move the seat out of the way. Seats can also be folded to increase cargo-carrying capability. 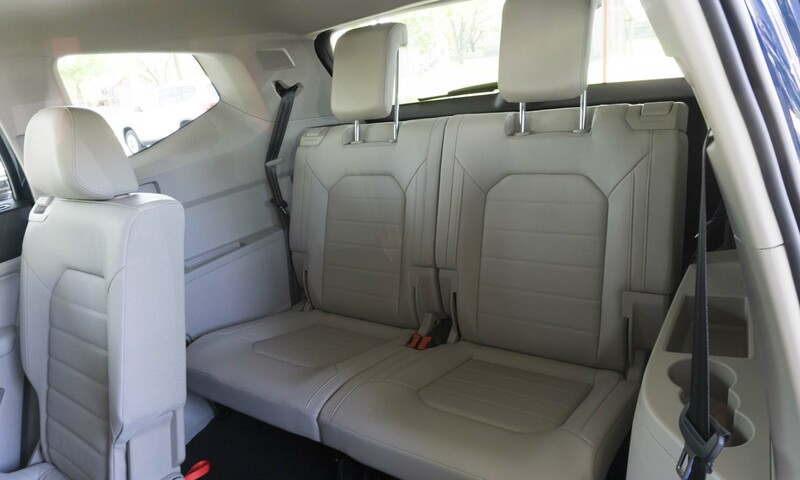 With the second-row seats tilted forward, access to the third row is easier than in many Atlas competitors. The third row seats two, and although the seats are wide they’re a bit stiff. Third-row seats are also quite low, which means adults will feel like their knees are in their faces. That said, the second row can be slid forward to provide a bit more third-row legroom. Even with the third row in place, the Atlas provides plenty of cargo space — easily enough room for a few full-size suitcases. 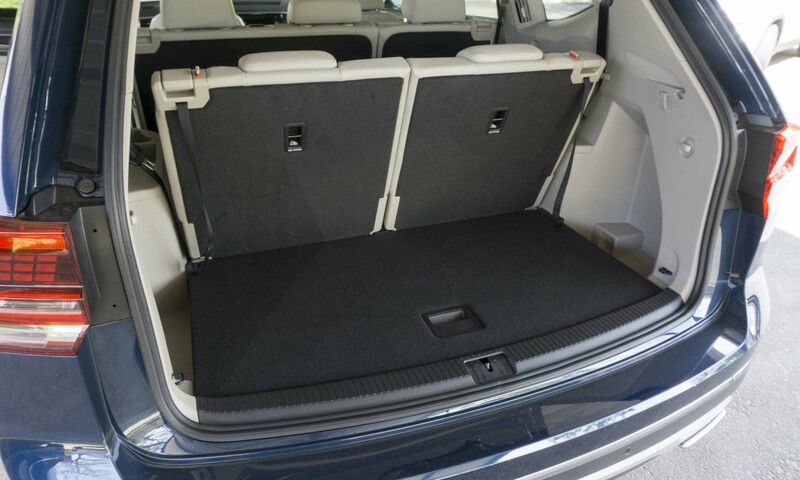 And all seats can be easily folded flat, creating a large cargo space. At launch the only powerplant available will be the 3.6-liter VR6 V6 engine producing 276 horsepower and 266 lb-ft of torque. Fuel economy is rated at 18 mpg city / 25 mpg hwy / 20 mpg combined for the front-wheel drive, and 17 / 23 / 19 with all-wheel drive. 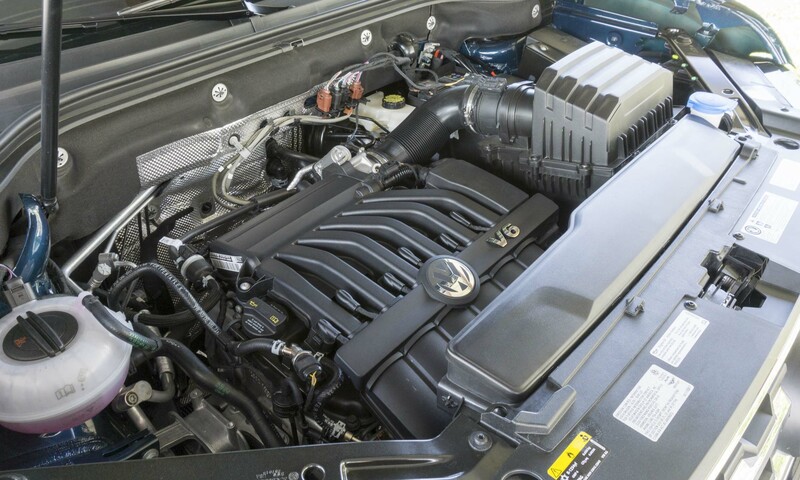 The V6 provides enough power to tow up to 5,000 pounds when properly equipped. 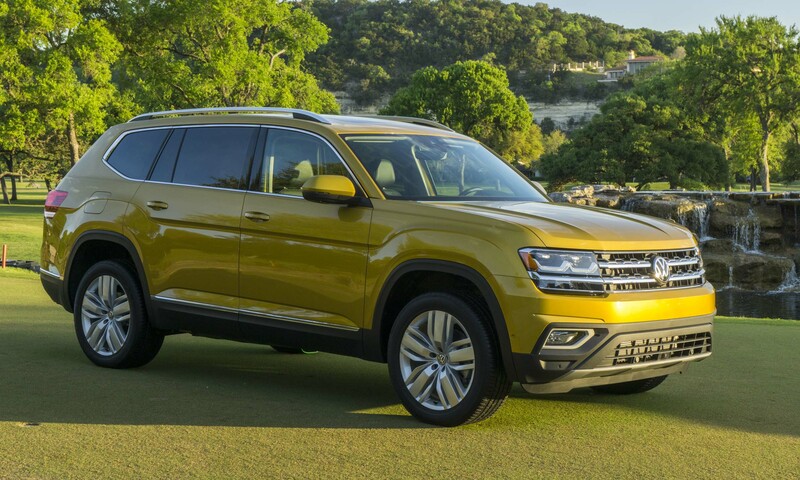 Later this year, the front-wheel-drive Atlas will be available with a 2.0-liter turbocharged 4-cylinder engine producing 235 horsepower and 258 lb-ft of torque. Towing capacity with the smaller engine tops out at 2,000 pounds, and fuel economy numbers have not been released. 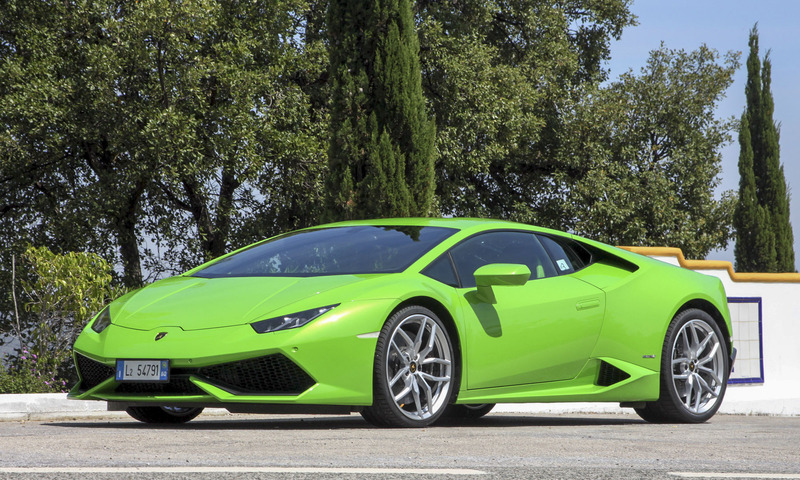 Both engines are teamed with an 8-speed automatic transmission. Driving the Atlas along back roads around San Antonio, Texas, we found the big SUV quite comfortable. The ride is smooth and solid, taking bumpy pavement and sudden elevation changes in stride. Handling is about what you’d expect from a large crossover — steering is responsive but the mass is quite noticeable as the road gets twisty. We were surprised by the amount of road noise; when the pavement gets rough it becomes quite loud in the cabin. With the V6 powerplant Atlas certainly has adequate power. We felt a lack of power only when attempting to accelerate up steep inclines — the engine was up to the task, but just barely. 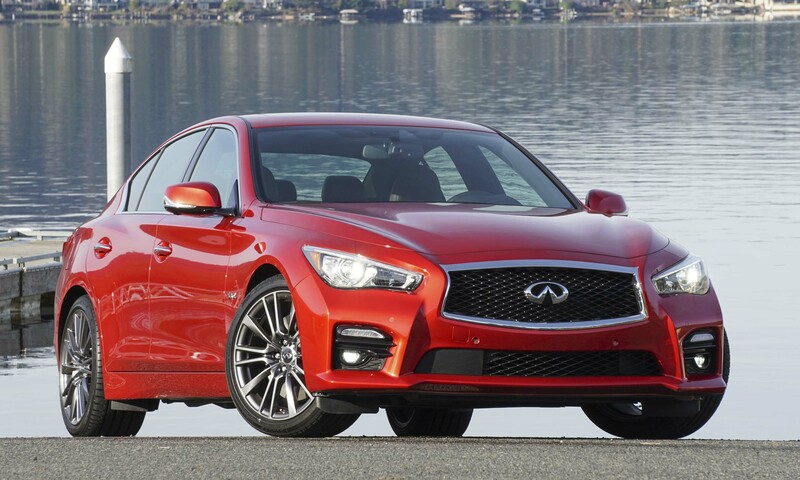 In most situations acceleration is strong and the 8-speed automatic transmission shifts quickly and smoothly. Putting the Atlas in Sport mode changes the shift points, which noticeably increases performance. We didn’t have the opportunity to take the Atlas off-road, and chances are most buyers won’t ever leave the pavement either. That said, Atlas has 8 inches of ground clearance and the 4Motion permanent all-wheel-drive system with adaptive torque distribution, so we would expect this big SUV to hold its own in mud or snow. 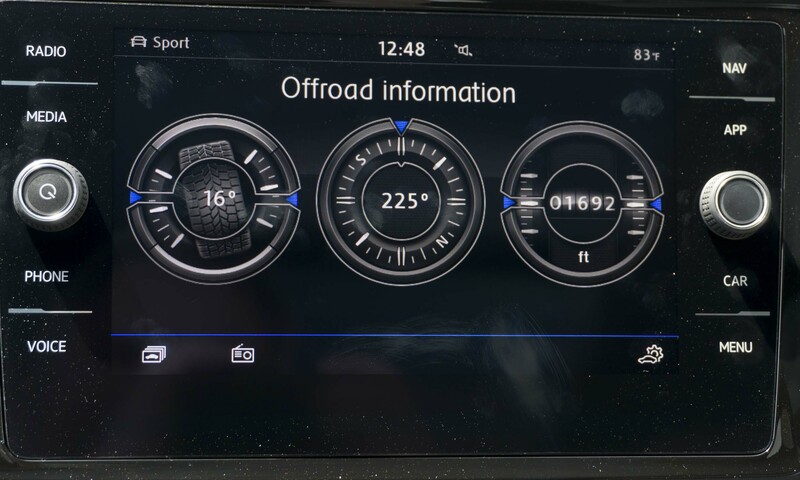 Atlas also has an additional off-road information screen that displays wheel angle as well as direction and altitude. 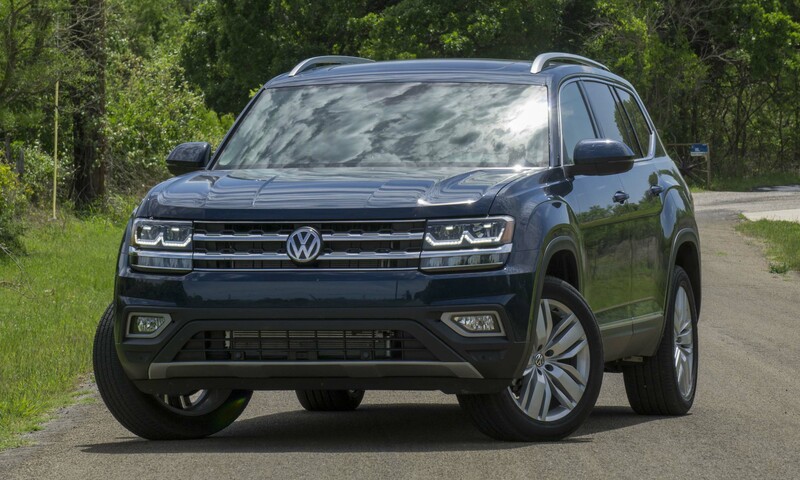 Volkswagen’s Park Assist system works well in the Atlas. The system allows for parallel or perpendicular parking — simply activate Park Assist, put on the turn signal to indicate which side you wish to park, and when a spot is located the on-screen instructions tell the driver when to stop or shift into Drive or Reverse. All steering gets handled automatically. Another great option lets drivers “fix” a bad self-parking attempt. If the angle is wrong and the Atlas can’t get all the way into a space, the driver simply activates Park Assist and it will reverse and correct the angle, performing a perfect parking job. No question, the 7-passenger crossover market is packed full of excellent choices, and with the Atlas buyers now have another great option. Styling may be a bit bland, but Atlas delivers where it counts with plenty of interior space, the latest in safety tech and convenience features, as well as a comfortable ride. A spacious family vehicle, Atlas maps to an excellent choice. Pros: Spacious interior; park assist; comfortable ride. Cons: Generic styling; road noise; low third row. 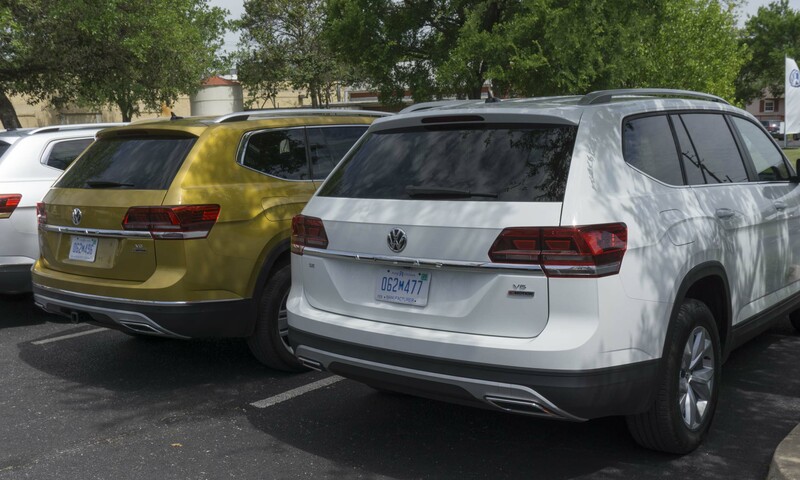 Bottom Line: VW’s biggest SUV in America provides shoppers with another admirable choice.